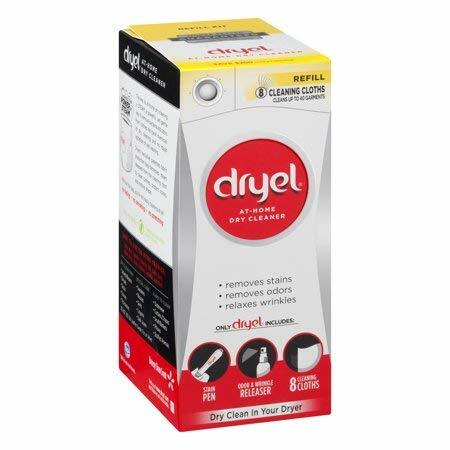 Dryel At-Home Dry Cleaner Refill. Kit contains: Dryer activated cleaning cloths - biodegradable cleaning agents; Stain pen - safe for dry clean only clothes; Odor & wrinkle releaser - deodorizes and releases wrinkles. A best way to clean and restore your special care clothes. Has breezy clean scent and no harsh chemical smell. Removes stains, odors and relaxes wrinkles. Works in just minutes in the convenience of your dryer, saving time and money. Gentler than dry cleaning or wet washing. Comes with more and works better than any other at-home dry cleaner. Safe to use on more fabrics: Cotton, wool, cashmere, polyester, silk, rayon, linen, nylon, ramie, acrylic, sequins, synthetics, and more. Contains no phosphate, perchloroethylene (PERC), or trichloroethylene. Safe for use in all HE dryers. The Dryel's exclusive patented fabric protection bag harnesses steam released from the cleaning cloth to clean clothes, protect colors, and restore shape. Dryel At-Home Dry Cleaner Refill. Cleans up to 40 garments. Only Dryel includes: Stain pen - 0.7 fl oz (20 ml). Odor & wrinkle releaser - 3 fl oz (89 ml). If you have any questions about this product by Dryel, contact us by completing and submitting the form below. If you are looking for a specif part number, please include it with your message.